Famed architect Frank Lloyd Wright is renowned for designing beautiful homes and buildings that blend into the natural environment. Many of them are in the Midwest, including a great number in Chicago. Wright designed homes in Ohio, Wisconsin, Pennsylvania, New York, and even Oklahoma. And one of his winter homes was right here in Arizona. 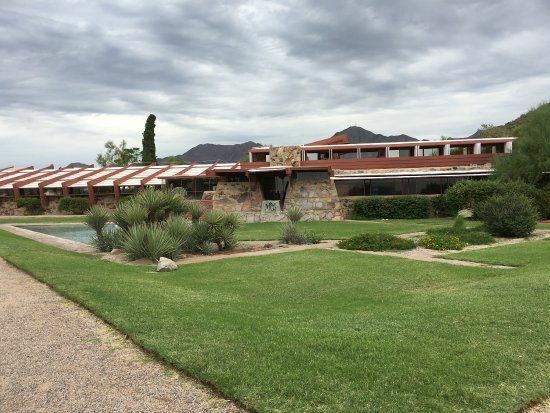 Taliesin West is located in Scottsdale – about 30 miles from my home, and it was Wright’s winter home and studio complex. As was true for all his structures, Wright’s design was greatly influenced by the natural surroundings, in this case desert and mountains. Recently, I got my first look at this beautiful place. The visit came about because I volunteer with someone who is intimately familiar with Taliesin. She wondered aloud if any of us would be interested in a behind-the-scenes tour with her. A half dozen of us said yes, and she set it up. Most everyone who visits there takes a tour, because many areas are not otherwise open to the public. We visited all those places. 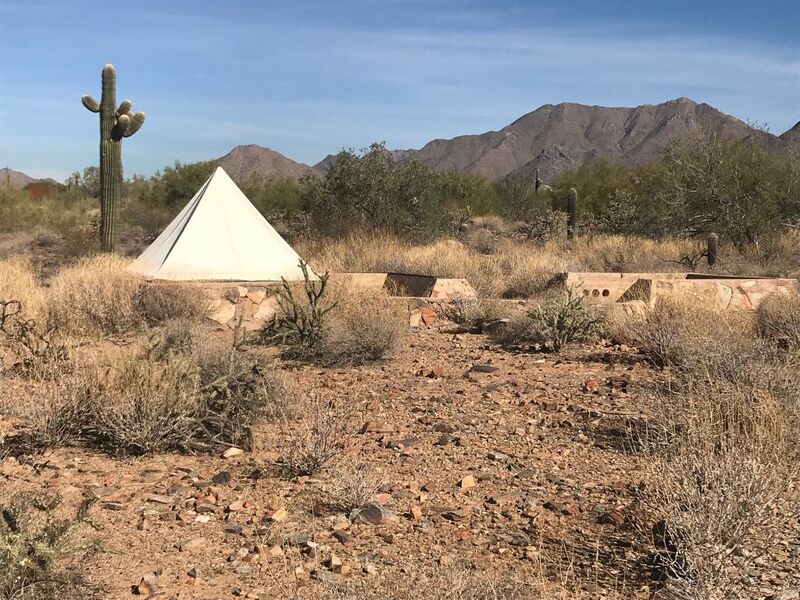 But because our guide had lived and worked at Taliesan West from the time she was young, our tour was enhanced by her personal stories and insights. For instance, as we walked through the living room, she reminisced about cocktail parties held in that room. When shown the bedrooms that had been occupied by Mr. and Mrs. Wright, our guide explained that her bedroom, when she lived and worked here, was very similar. The rooms had permanent walls on three sides, but one side was open, with views of the desert and the mountains. Then and now, canvas “doors” could be closed for privacy but still let in some air. The architecture blends into the natural environment. After we had seen the public areas, she took us up to the private sun deck, where we enjoyed the spectacular view and met her sister, who works and lives there now. It was fun to imagine how often Wright and his apprentices sat up there and discussed a million things about architecture and life in general. And speaking of apprentices, young men and women still study at Taliesin, which currently houses an architectural school. There is no undergraduate program, but someone with a Bachelor’s degree can earn a Master’s degree. And, others come to study as enrichment, but don’t have to enroll in an institutional program. We met one of the Master’s students, a young man who is in his fifth year there. He sounded regretful when he said he would probably graduate in the spring. I believe he would like to stay there indefinitely. And, he showed us what was, for me, the most interesting part of the tour, and something the public tours never see — the student residences. Naturally, students are encouraged to be creative in their designs, and every structure is different. Some are very simple; some are quite elaborate. They are small, containing a bed and a fireplace, and perhaps a small table, but no closets. All are open, with a roof of some sort. They are either raised above ground or are surrounded by a short wall, to keep out wildlife. We were shown one that was large enough to house a family, and our friend said it was exactly the type of construction their family lived in when her father apprenticed there. I took many photos of the designs that dot the desert around the house. I wondered what it would be like to walk in the dark through the desert to your bedroom. 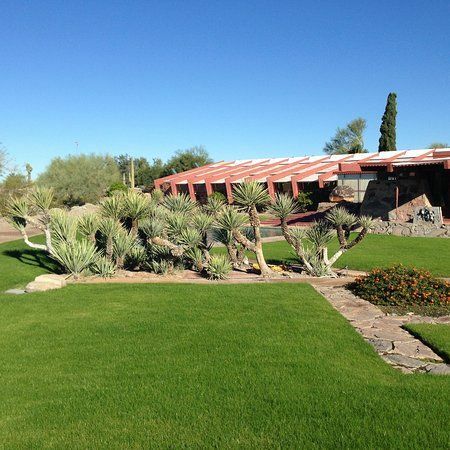 Frank Lloyd Wright was, by many accounts, a difficult man. But his creativity, not only in his designs but also in his way of viewing the world, had a tremendous impact. It’s apparent that those who really knew him looked beyond his foibles to the talent and energy of a man who took the architectural world by storm. Now, I feel that I know him a bit better myself. That house looks amazing, I knew his name but nothing else so I googled him. He lived quite a life. It was fun to see the house through the perspective of someone who had lived there.